Buy Sport Bottles, thermo flask and mugs at wholesale price! Welcome to GIFTMUGS.com.my – Malaysia leading supplier of drinkware containers and promotional mugs with personalized logo printing. All our products are ready stock and suitable to be given out as corporate gifts. 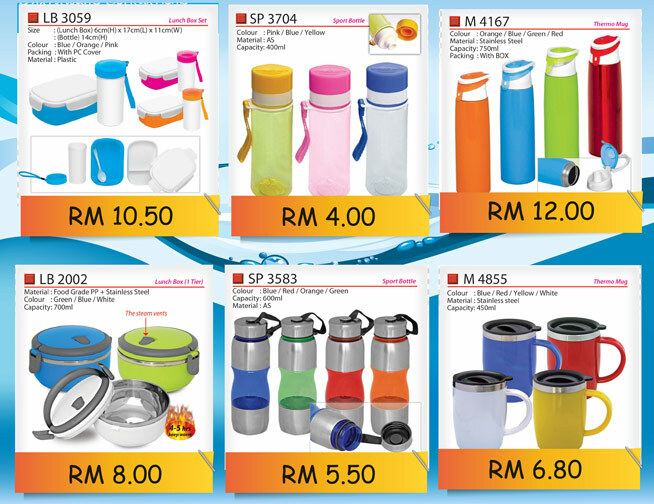 We pride ourselves on having one of the Malaysia largest ranges of drinkware including thermo mug, thermo flask, vacuum flask, sport bottle, BPA free plastic bottle, coffee mugs, ceramic mug, colour glass mugs, water tumblers, travel thermo flask set and lunch box. We supply as well as personalize the items with various printing techniques including silk screen printing, pad printing, heat transfer and dye sublimation for photo realistic printing. Custom printed mugs make useful promotional products, for practically any events like fundraising, annual dinner door gifts, colouring competition, sport day and corporate gift for clients. Promotional mugs are considered cost effective and universal accepted as efficient promotional item. It is practical in life and has high retention value to the receivers. Why should you choose us as your promotional mug supplier? -We have 10 years of experience in dealing with premium corporate gifts. Look no Further and contact us today to get your promotional gift needs. We are one of the leader in Malaysia in supplying promotional printed mugs to local companies with wholesale price. We have extensive selection of promotional mugs ranging from thermo mugs, thermos flask, sport bottle, ceramic mugs, colored glass and drinkware accessories to cater for your marketing purpose. We are constantly sourcing the latest design to ensure your printed mugs eye-catching and appreciated by the receiver of the gift. Ready Stock with Wholesale Price! We understand that pricing along with the quality is a big factor in promotional gift industry. Our commitment to customers are to supply good quality promotional drinkware with competitive pricing and vast selection of ready stock with different design and material available for customers selection.